SLOVYANSK, Ukraine -- Ukrainian security forces resumed an anti-separatist operation Friday near Slovyansk, a district center in the eastern part of the country that had been seized by armed pro-Russia gunmen in April, an official said. A Ukrainian military helicopter flies near a Ukrainian checkpoint near the town of Slaviansk in eastern Ukraine May 2, 2014. Nine separatist checkpoints were stormed and captured on the outskirts of Slovyansk as the town was tightly surrounded by government troops, acting Interior Minister Arsen Avakov wrote in his Facebook account. “It is a real battle with professional mercenaries, terrorists who do not hesitate to shoot hiding behind the backs of peaceful residents of Slovyansk,” Avakov wrote. The separatists responded with heavy fire including grenade launchers and portable antiaircraft rocket systems, Avakov said, adding that one helicopter pilot was dead and there were wounded among the security forces. 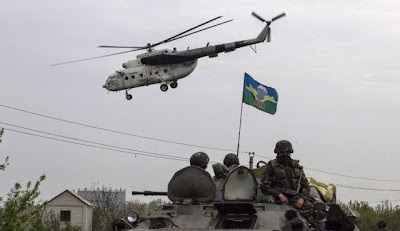 The Ukraine Defense Ministry said two Mi-24 helicopters were shot down over Slovyansk, with two servicemen dead and several injured. Later in the day the military detained four separatists suspected of shooting down the helicopter, the Defense Ministry said on its Facebook account. Those who oppose the government forces in Slovyansk are not peaceful civilians but quite well prepared and armed professional sabotage groups, read a statement posted on the ministry's Facebook account Friday. “According to the preliminary data, the combat wing aircraft were shot down by unknown persons by means of portable air defense systems,” the report said. Three pro-Russia gunmen and two local residents were killed during the morning attack, self-proclaimed mayor of Slovyansk Vyacheslav Ponomaryov said. “We are holding on to our positions and are not planning a retreat,” Ponomaryov said in a phone interview to The Times. Ponomaryov was talking about three dozen hostages the separatists have reportedly been holding in the local Security Service building, which they have turned into their key stronghold in town. Among the hostages are six military inspectors of the Organization of Security and Cooperation in Europe and their translator, abducted by the separatists last week. A pilot of one of the downed helicopters was taken prisoner by “the self-defense forces” Ponomaryov said. All the roads to Slovyansk were blocked by security forces, eyewitnesses said. “There are armored vehicles and even tanks based at every approach to the town,” Alexei Shebanov, a 36-year-old local taxi driver, said in a phone interview with The Times. Local residents said they heard intensive shooting and explosions on the outskirts of the community in the morning. “I was woken up by the sound of a siren and the ringing of the bells in the local church,” Victoria Filchenko, a 30-year-old professor at Slovyansk Pedagogical University, said in a phone interview. The streets were deserted in the morning but when the shooting subsided, residents began to venture out, some of them helping the armed separatists to block streets with barricades of tires and trees they felled for that purpose, she said. “I am really scared now, especially for my year-and-4-month-old son,” Filchenko said. In the early hours of the afternoon, people were emptying the shelves of the only food store still open in one of Slovyansk's suburbs, said Anna Adam, 37, a psychologist at a local orphanage for disabled children. “There's a huge line of people in the shop buying everything they can carry,” Adam said in a phone interview. Slovyansk is considered the epicenter of an armed rebellion in eastern Ukraine that is coordinated by Russian military intelligence agents, Ukrainian security officials have previously charged. Russia vehemently denies such involvement. Russian leader Vladimir Putin is being informed of the developments in Slovyansk, his spokesman, Dmitry Peskov, said Friday. While Russia “is making efforts to de-escalate and resolve the conflict, the Kiev regime resorted to firing at peaceful settlements by combat aviation, began a punitive operation, Geneva accords in fact destroying the last hope for viability of the Geneva accords” aimed at easing the conflict, Peskov told the Itar-Tass news agency.